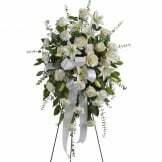 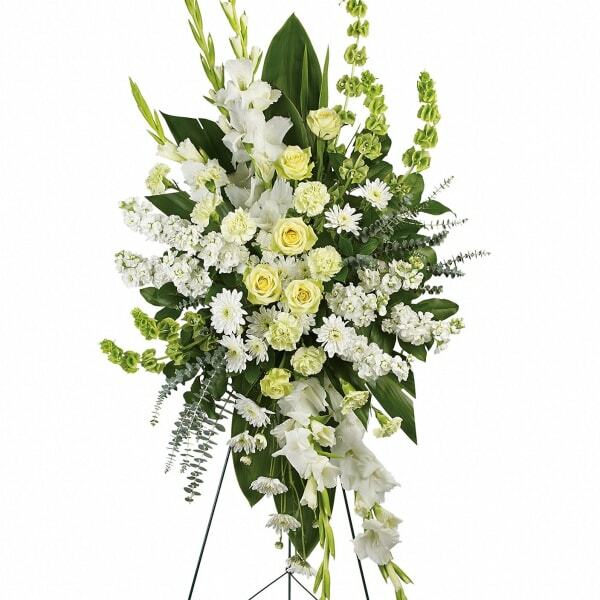 An elegant expression of sympathy, this wondrous white and green spray conveys purity and peace. 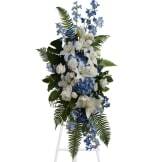 A glorious choice for a magnificent memorial. • This gorgeous array of green roses, green carnations, white gladioli, white stock, white cushion spray chrysanthemums and bells of Ireland is accented with green ti leaves, spiral eucalyptus and lemon leaf. 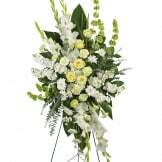 Measures approximately 29" W X 58 1/2 " H.
Flowers will be received by a Wolfe-O'Neill Funeral Home's staff. 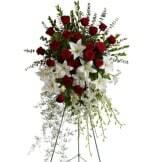 All of our flowers are designed and delivered by hand from a local florist in in Kalkaska.